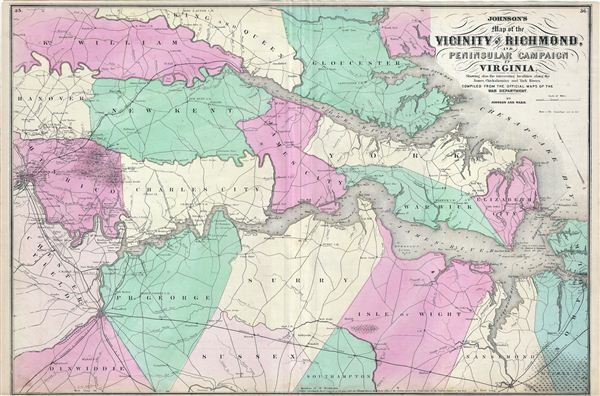 This is a rare and important 1862 A. J. Johnson map of the vicinity of Richmond, Virginia, during the American Civil War. The map shows the Union advance during the Peninsular Campaign of the American Civil War, including considerable detail ranging from nautical depth soundings to individual buildings, wells, and bridges. The Peninsula Campaign (also known as the Peninsular Campaign) of the American Civil War was a major Union operation launched in southeastern Virginia from March through July 1862 and the first large-scale offensive in the eastern Theater. The operation, commanded by Major General George B. McClellan, was an amphibious turning movement against the Confederate Army in northern Virginia, intended to capture the Confederate capital of Richmond. McClellan was initially successful against the equally cautious General Joseph e. Johnston, but the arrival of the bold and aggressive General Robert e. Lee turned the subsequent Seven Days Battles into a humiliating Union defeat. Very good. Minor wear along original centerfold. Narrow margins. Minor verso repair along bottom margin. Rumsey 0535.024. Philips (atlases) 4345.